Newton County - Arkansas State Forestry Comm. 1935: The 100-foot steel tower was erected by the members of Camp #1703 of the Civilian Conservation Corps. 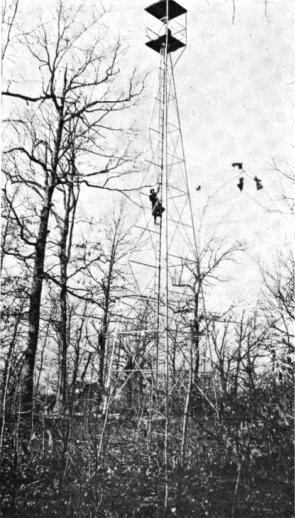 1911: One of seven 64-foot steel towers erected by the Ozark National Forest. At the top of the tower is a 5x5 foot square open platform for the observer. 1937: 100-foot steel tower erected. February 16, 1935: "Location of one of the four new towers to be constructed in this district by the State Forestry Commission has been selected near Chidester, according to N.K. Clemenson, district official today. Glen R. Durell, of Little Rock assistant state forester in charge of fire protection for the Arkansas State Forestry Commission, approved the site. He is on a tour over the district where three other steel towers will be constructed. The tower in this county will be two and one-half miles from Chidester on the Chidester-Stephens highway. Materials for the towers will be placed on the ground soon and work is expected to start without further delay. March 23, 1935: "Construction of the steel tower at Chidester, 16 miles west of Camden, for the Arkansas State Forestry Commission, will start within the next ten days or two weeks, C.A. Gillett, of Little Rock, state forester, said here today. Steel for the new tower was placed on the site today. W. Rogers, of Camp P-51, Malvern, engineering foreman, was here looking over the site and to make final arrangements for work. The fire-watchtower stood adjacent to the CCC Camp Sage. 1912: See the story at High Peak on this date. 1912: See entry at High Peak for this date. 1933: Lookout built by the Civilian Conservation Corps.